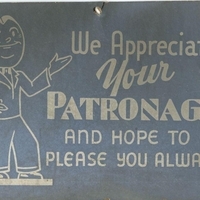 Business sign thanking customers for their patronage. The sign belonged to a business owned by Ella Wall located on Main Street in Apopka, Florida. Ella Wall (1874-1938) was an entrepreneur and businesswoman of Apopka who served as the inspiration for a character in Zora Neale Hurston's novel Mules and Men. Wall was born in Washington County, Pennsylvania, in 1874 and moved to Apopka as a widow. Throughout her lifetime, Wall purchased four parcels, of land. She operated an orange grove and also constructed small wooden buildings that she rented out to migrant workers. Wall was also a friend of Michael Gladden, Jr., the executor of the George W. Oden estates, until her death in 1938. Original business sign: series I, box 1, folder 1, African American Legacy: The Carol Mundy Collection, Special Collections & University Archives, University of Central Florida Libraries, University of Central Florida, Orlando, Florida. Digital reproduction of original business sign. Series I, box 1, folder 91, African American Legacy: The Carol Mundy Collection, Special Collections & University Archives, University of Central Florida Libraries, University of Central Florida, Orlando, Florida. Carol E. Mundy Collection, RICHES of Central Florida. Folder referenced in African American Legacy: The Carol Mundy Collection, 1720-2010 finding guide. Collected by Carol E. Mundy between 1990 and 2009. Purchased by the University of Central Florida Libraries, Special Collections and University Archives in 2009. All rights are held by the respective holding institution. This material is posted publicly for non-profit educational uses, excluding printed publication. For permission to reproduce and or for copyright information contact Special Collections and University Archives, University of Central Florida Libraries, (407) 823-2576. http://library.ucf.edu/about/departments/special-collections-university-archives/. Apopka Historical Society. Apopka. Charleston, SC: Arcadia, 2004. We Appreciate Your Patronage And Hope To Please You Always. 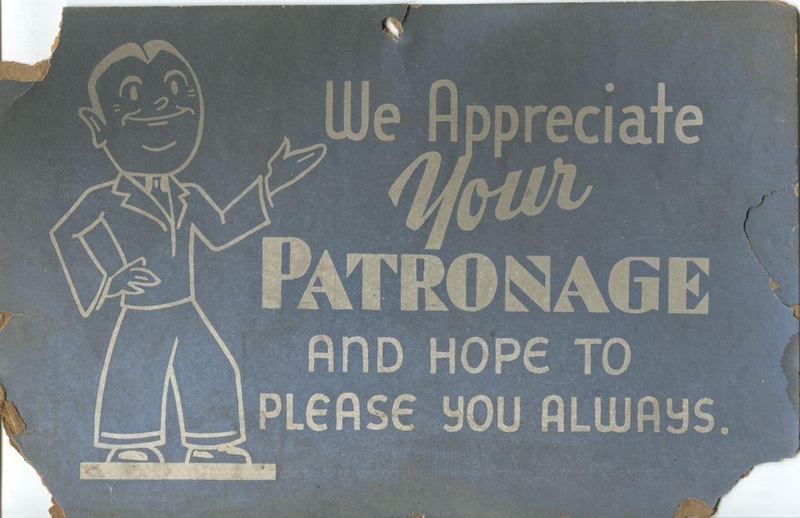 “We Appreciate Your Patronage Sign.” RICHES of Central Florida accessed April 18, 2019, https://richesmi.cah.ucf.edu/omeka/items/show/2899.